Woebcken: "OEMs tend to be a little bit arrogant when it comes to understanding the customer." DETROIT -- Volkswagen's U.S. recovery from the diesel emissions crisis has been possible in large part because the North American region is able to exercise some autonomy from corporate headquarters in Germany, the CEO of Volkswagen Group of America said. Hinrich Woebcken, 57, who took over the brand's North American region in 2016 as the automaker was deep into the mire of its $30 billion diesel emissions scandal, said heeding its dealers with a product lineup and business model that catered more to U.S. tastes helped the automaker rebound in sales and market share in 2017. 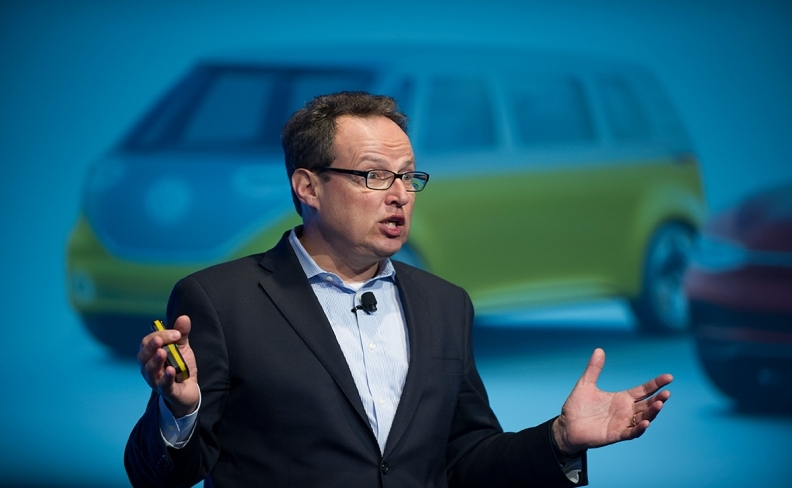 "OEMs, I believe, tend to be a little bit arrogant when it comes to understanding the customer," Woebcken told the audience at the Automotive News World Congress on Tuesday. "In reality, the OEMs don't look into the eyes of the customer; the dealers do. I think the dealers have, in many aspects, similar wishes like the OEM has: They want to grow. They were disappointed about the wrong product strategy in the past, and the big diesel disappointment came on top." The diesel emissions scandal, which was exposed in September 2015 and has cost the automaker more than $30 billion, also catalyzed a global reorganization within Volkswagen Group that empowered regions to design, build and market their own vehicles, based on the automaker's global platform strategy. As a result, Volkswagen of America has been able to quickly expand its crossover offerings, which dealers had been craving. In the last year, Volkswagen has introduced two three-row crossovers: the Atlas, built in Chattanooga, Tenn., and the Tiguan, built in Puebla, Mexico. The crossovers have added balance to the brand's formerly sedan-heavy U.S. lineup, with two-row versions due next year to further expand crossover options at its 652 U.S. dealerships, Woebcken said. As one of the world's three largest automakers, Woebcken said, Volkswagen had grown overconfident from its success in Europe and China but didn't understand why it wasn't successful in the U.S. employing the same strategies it did there. Volkswagen's history in the U.S. is largely one of squandered opportunity, Woebcken said. "If you look at the history of the brand in America, if you look at the late 1960s and 1970s ... lots of people bought Beetles and the Microbus," Woebcken said. "A whole generation grew up in those two cars and loved them. We had very good market shares. But since then, if we are honest, we didn't shape this brand into a volume brand like we are all around the world." Woebcken said he believes that Volkswagen will soon be in a position to compete directly with domestic automakers in the U.S., with products and positioning that make sense from a regional market. "In order to be successful in America, you have to be in America," Woebcken said. "I stand for really teaching everybody in the company and in headquarters that America is different."